Kanazawa, easily accessible via the Hokuriku Shinkansen from Tokyo Station, offers travelers a wide range of experiences, from hands-on craft and cooking classes to strolling beautiful Japanese gardens and samurai and tea districts. Formerly known as Kaga, Kanazawa was ruled by the powerful Maeda clan, who were second only to the Tokugawas in wealth and power. The fertile Kaga domain produced five million bushels of rice annually, which earned it the title “Hyakuman Goku” (a goku was a measurement of rice). Although little remains today after a series of fires, Kanazawa Castle is still worth a visit. Located across from Kenrokuen (known as one of the top three classical gardens of Japan), it was the seat of power of the Maedas and has a second smaller garden, Gyokusen’inmaru, which was originally built as the residence of the wife of Toshinaga Maeda in 1614 (the garden was established later in 1688 and restored in 2015). Gyokusen’inmaru is illuminated to spectacular effect nightly until 9 p.m. on Fridays and Saturdays with a seasonal light and music show. Kenrokuen is one of the jewels of Japan; based upon six classical attributes, you’ll find beauty at every turn. Be sure not to miss green tea in the beautiful teahouse set over the pond and the famed Kotojitoro lantern. Kanazawa is home to three well-preserved tea districts, the most photogenic being Higashi Chaya. There are still around 40 geisha (“geigi” in local dialect) working in Kanazawa, and you can see them perform at Geisha Evenings in Kanazawa, at Kanazawa Geigi no Mai, or if you have extra cash, by private appointment at Kikumi. You can also tour historic geisha houses Shima and Kaikaro for a fee. Nagamachi Bukeyashiki District contains the homes of the samurai who supported the Maeda clan. The standout is the Nomura House, with its gorgeous garden and upstairs tea room (matcha available for an extra fee). Nearby Myoru-ji (“Ninja Temple”) requires advance reservation and was designed as a defense outpost complete with secret passageways, nightingale floors and trapdoors. I also had the pleasure of touring Kenrokuen and Higashichaya with one of the fantastic guides from Kanazawa Goodwill Guides; if you’re looking for a more in-depth history lesson, definitely consider signing up for a volunteer guide. Kanazawa produces 99% of gold leaf in Japan for every imaginable use, from cosmetics and lacquerware to edible gold flakes, religious art, housewares, and one of Kanazawa’s most Instagrammable treats, gold leaf-draped soft serve. At Hakuichi Hakuko-kan, you’ll find a museum devoted to the history and production of gold leaf with videos in Japanese and English, the chance to watch craftsmen at work, and some truly spectacular gold work on display. Hakuichi’s gold leaf gifts make great souvenirs, and you can even sign up to make your own masterpiece in the form of a gold leaf coaster, small dishes, or chopsticks (advance reservation required, https://www.hakuichi.co.jp/). Kanazawa’s riches also resulted in the evolution of kaiseki and Kaga Ryori that uses 15 Kaga vegetables and local specialties such as duck. 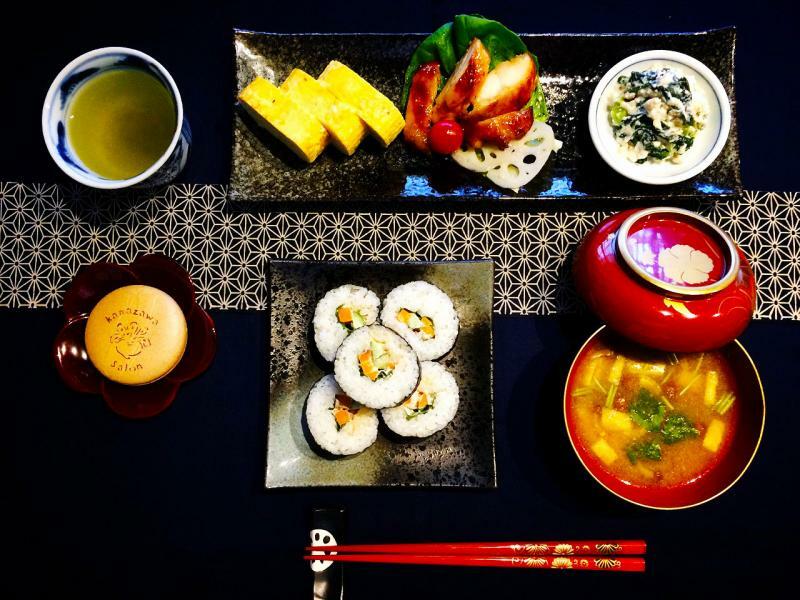 Kanazawa’s many temples also gave rise to Kaga Shojin, a variation on Buddhist vegan temple cuisine. You can sample all three cuisines at the exquisite Kotobukiya, housed in a gorgeous 150-year-old kimono shop. Each of the private dining rooms has elegant touches and the food and service were impeccable. If you prefer a hands-on approach, consider a market tour and cooking class with the lovely Moe and Chikako of Cooking Studio Kanazawa Salon. Hosted in a restored machiya townhouse, you’ll learn about the history, production, and use of koji (the base for miso, soy sauce, sake, and more) as flavoring agent and health food in the modern kitchen. You’ll then cook a customizable menu of traditional dishes such as jibuni while making new friends and memories. Daisetz (D.T.) Suzuki was a renowned Buddhist philosopher who helped introduce Zen to the West. Born in Kanazawa, Suzuki was a prolific author, translator and lecturer at a number of Western universities and was nominated for the Nobel Peace Prize in 1963. Designed by architect Taniguchi Yoshio, the open spaces, clean lines, and reflecting pool (Water Garden) of the D.T. Suzuki Museum radiate Zen calm. Inside, you’ll find quotes and manuscripts from Suzuki’s works and essays on Zen and Buddhism. Kokoyui Kimono Rental was opened in May 2010 by owner Haruka Koshida, who feels putting on a kimono brings happiness to the wearer. With 800 kimonos to choose from, Kokoyui will take care of all the details and even offers optional services like a licensed guide, photographers, and cultural experiences to make your visit to Kanazawa a memorable one. 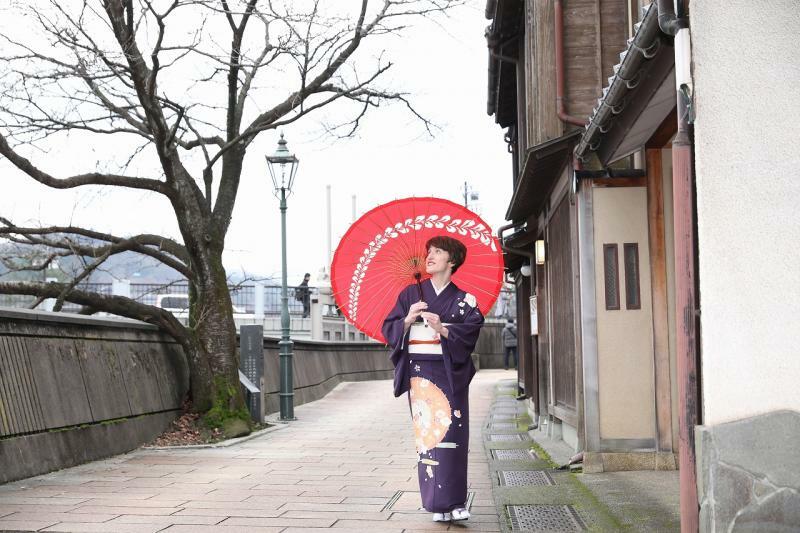 Due to the labor-intensive, lengthy dyeing process, Kaga Yuzen kimonos are expensive and delicate, and it was an honor to spend the day touring Kanazawa in a gorgeous purple Kaga Yuzen kimono from Kokoyui. Why not stroll Kenrokuen or Higashichaya in a beautiful silk kimono for an unforgettable memory of your trip to Kanazawa?